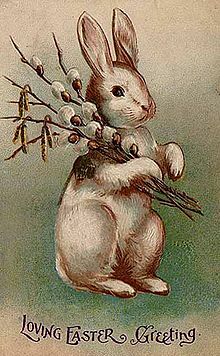 Today is Summer Solstice and I try to remember how many times I have marked this occasion with pretty pictures on this blog. 5 times, 6 times? Admittedly, I have been painfully absent from this site, there would be just so much one could upload and write about, especially during summertime. And I have not… I’m way too preoccupied these days! Instead, I am stealing a photo from the shop’s website – it showcases not only Portland nature but also three lovely outfits by SkunkFunk. I promise I will continue to now and then showcase great fashion and let you in on my adventures in that realm on this blogsite. As the posts won’t be very frequent, consider installing an RSS feed on your device – that way I connect with you when I do write something! The day I sold my car was summery, dry and warm. Of course, the very next day the skies opened up, the temperature dropped to just above freezing – and I had no vehicle. It was as if the universe was testing me. This was also he first day of figuring out how to get around in this very car-driven (sic!) society. What about shopping? How do I get home the carton of half gallon milk along with bread, eggs and a six pack? Of course, I can do this. Not only do I have a bike with a basket, I also signed up for Car2Go – where I can find a little Smart pretty much everywhere in my neighborhood. 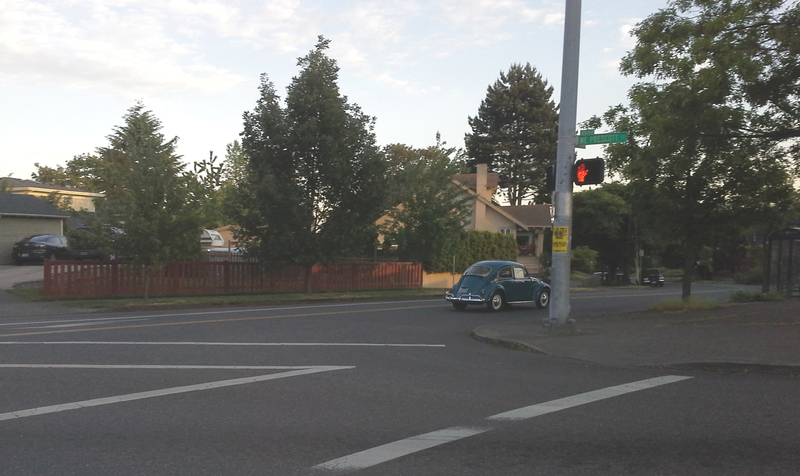 This whole car situation and my renewed motivation to preserve to environment and live sustainably triggered a bunch of other observations and experiences. What does it take to feel satisfied with your choices? How much does one need to live safe and comfortably? I went to a fast-food outlet to get some lunch. We were on the road, with not much time to spare, and hungry. I chose a Mexican fast-food restaurant, they make some filling, not too offensive food. The quesadilla I had was done with a ‘four cheese’ mix and some salsa. Filled me up. For the moment. It did not take long and I was hungry again. And while I could have just gotten another little thing, the taste of the quesadilla lingered in my mouth, the salty quick fix and I almost wanted more. They say there is an addictive quality to fast food. And while I don’t think I got ‘hooked’ after one experience, I do get a sense on why people want this food – it never leaves you sated, well fed and happy. You want more. More of the addictive salty taste, the easy texture and non-offensive spices. 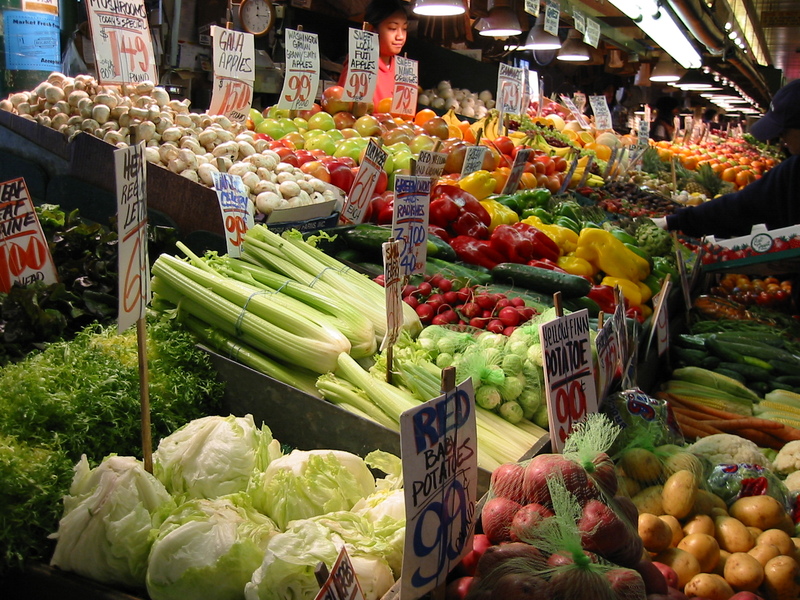 And then, look at all the beautiful meals you can make out of these vegetables! You know what is going into your food, no additives, no processed stuff. My one-time fast food experience made me realize how good I feel when I prepare my own food and use interesting spices. A few days later, I had a conversation with a customer about the book Overdressed. 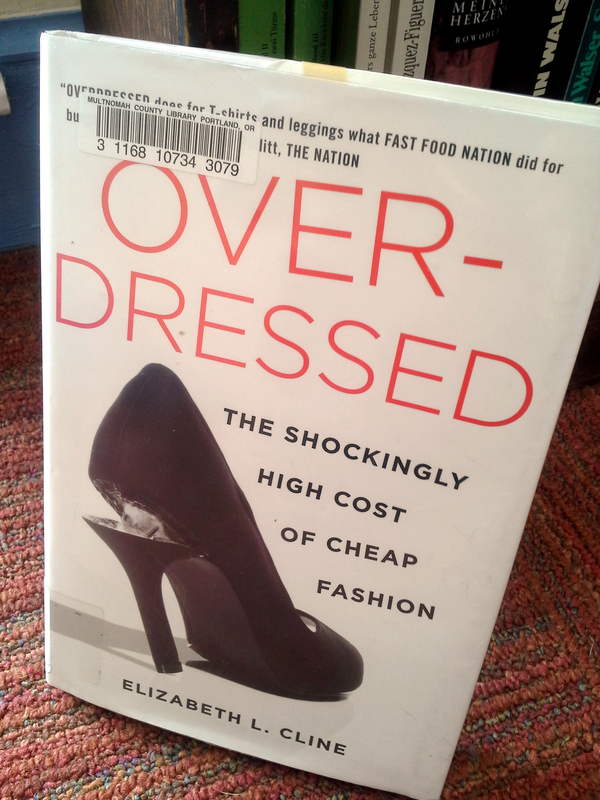 You know, the one where the author tries to shed light on the cheap clothing industry. The conversation was triggered by the recent fire in the garment factory in Bangladesh. I equal the fast and cheap clothing industry to the fast food chains. Cheap, bland clothing leaves me just as dissatisfied as the quick meal. Yet, because the clothing is so cheaply made and basically un-interesting, people go back for more. 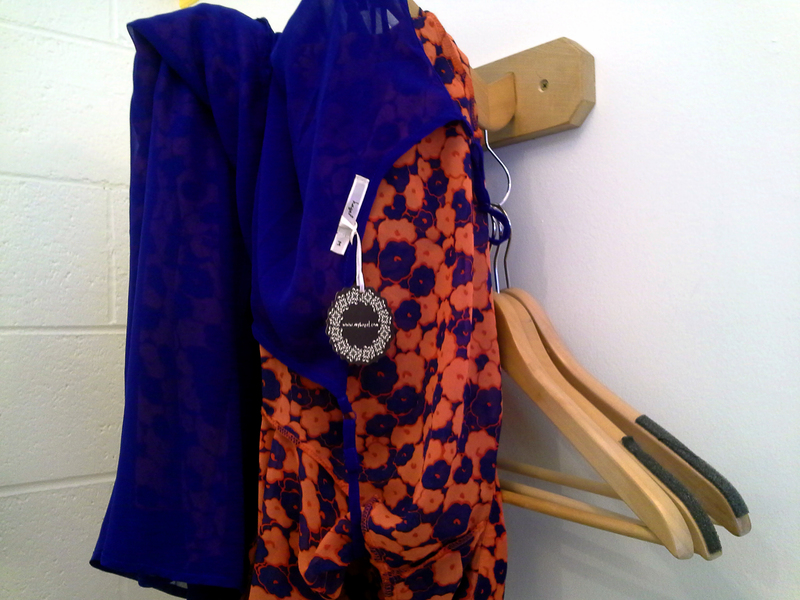 More bargains, more color for their -already- overstuffed closets. Maybe I am generalizing here but the feeling you get when you wear a well-made, interesting garment on your body – just leaves you … satisfied. I can’t help it – but losing my car, this instant gratification at my fingertips, opened up a few pores and now I’m sensitive. Or blame it on the full moon. 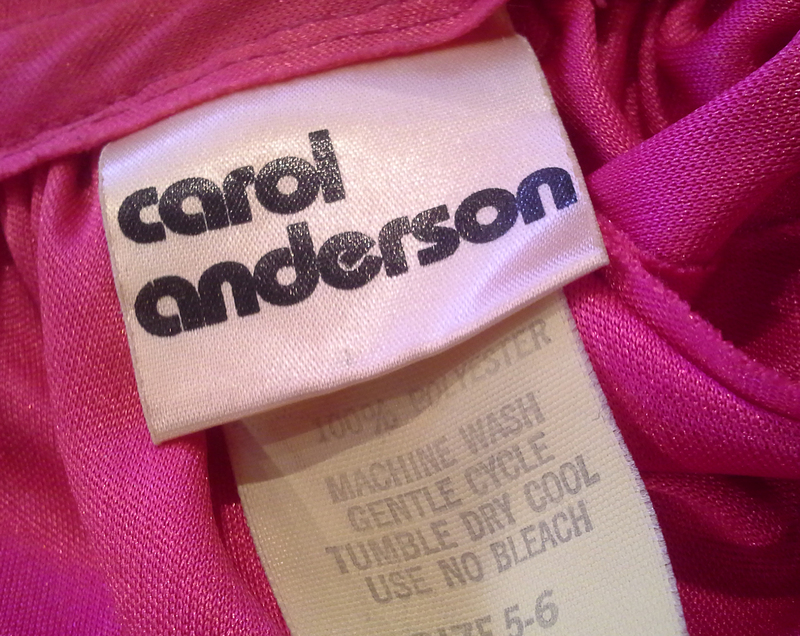 Carol Anderson is not a brand I carry. I have attended a few home parties and generally like the outfits. So I was surprised to hold an actual Carol Anderson dress in my hands that a customer had left for me to alter. Since then Carol Anderson has changed directions. She no longer supplies retail outlets but sells exclusively through home sales ‘consultants’ (Carol Anderson by invitation). On her website, it won’t tell you anything about her story but I found a blog entry that describes it pretty well. 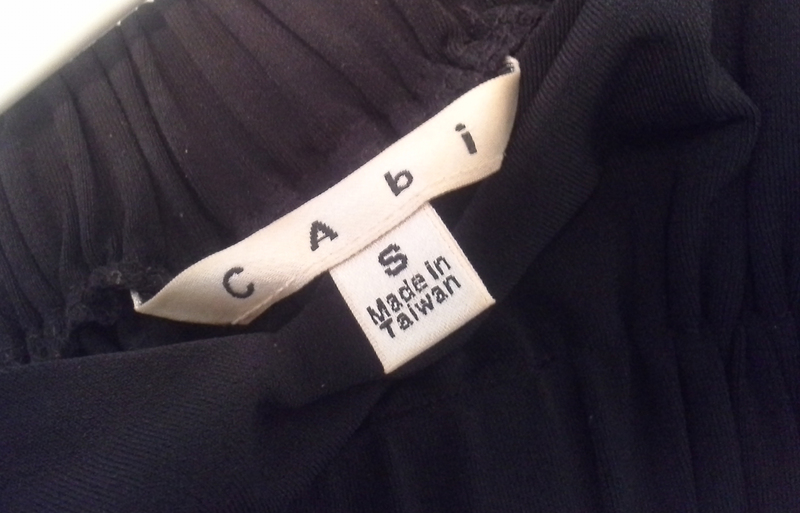 A few years back I was constantly invited to attend a CAbi sales party and went a couple of times. 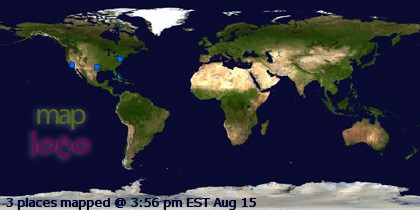 Today, either the market has dried up a little or they just don’t invite me anymore. I haven’t had an invitation in ages. The whole home party thingy is a bit difficult for me as I always feel like I NEED to be a good guest and buy something. 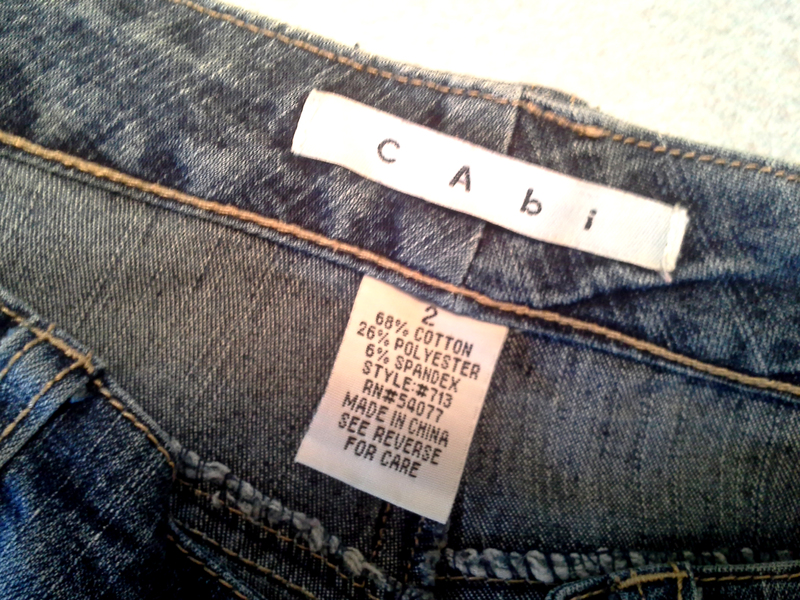 Which I have done at a CAbi show because her clothes are really nice and beautifully detailed. Carol Anderson also makes her clothing in China. This designer has been around for a long time. With companies bringing back work to the US, I wonder if she will be one of them. If I ever write a book, that will be the title. This is just one of the many hilarious comments I get in the store. There are moments I wish I had a tape recorder. Other moments, I wish I would be bold enough to take a picture of what folks are wearing when they are out and about. Then there are some that leave the dressing room like a warzone. I don’t mind cleaning up – that is actually my job… Sometimes, there are so many outfits in the dressing room as if the woman had tried on the entire store. Loves everything, everything fits, and then she leaves with the words, ‘I have to bring my daughter in.’ or, ‘I will be back when I get paid.’ I sincerely hope they had a good time looking and feeling good while in my dressing room. I shall not give a book report here, there are good reviews out there like this one from the Huffington Post and a summary that I found on the author’s website. Elizabeth Cline’s writing style did not really excite me but she sure gets her point across. And while I thought I knew a lot about the fashion industry, sewing and how seamsters are paid, I learned a LOT more. Take for instance the amount of clothing that ends up in the landfill. I already knew that in Germany, when they are trying to ‘add’ more caskets to existing cemetery plots, they discover that more and more bodies haven’t decomposed the way they should have. This is due to the clothing the people are buried in. More and more people are being buried wearing synthetic fibers and they take FOREVER to decay. Here in the US burial practices are different (and we have way more room) , so this might not be an issue. However, the practice of donating used clothing to charities and thrift stores is very, very common. So much gets donated that it can’t possibly get sold, made into rags OR even be sent to developing countries. Yes, you guessed right – it ends up in the landfill. Where it doesn’t disintegrate. And pollutes the land. 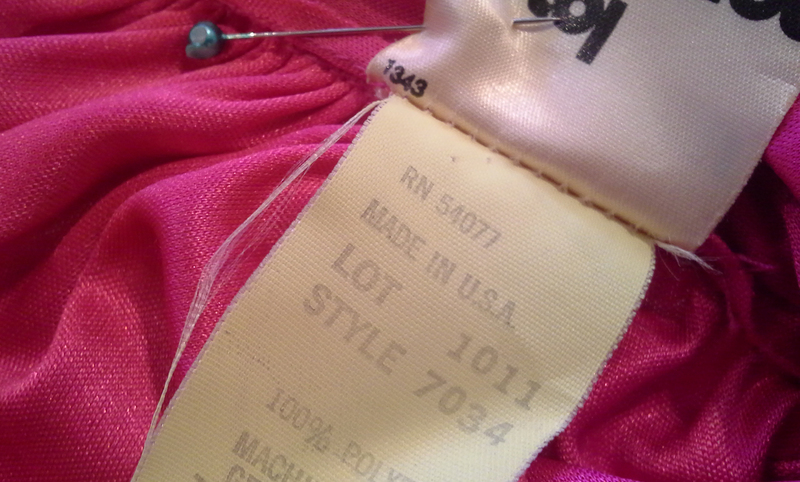 The overabundance of ‘used’ clothing has much to do with the ‘overproducion’ of clothing, especially cheap clothing. Most chain stores, especially stores like Target, H&M, Zara, Kohl’s, bring a constant flow of clothing into their stores. The sheer volume that gets sold at rock-bottom prices generates a nice profit for these stores. Cline interviews people in her book who confess to not even washing their clothing item – it was so cheap that they rather buy a new one. Or they wash it a couple of times, it then falls apart and ends up in the trash, again. In addition, there is this thrill of owning something new, so these stores make sure that they turn over their stock every two weeks to a) make you come back often and b) buy something every time because it will be gone if you don’t. Cline illustrates an aspect in the book that strikes home with me: sewing your own, caring for, mending and altering clothing. She calls this the ‘slow clothes movement’. The point is that if you own something that is well made, out of nice fabric – preferably wool, silk or cotton – you can have it for a long time. 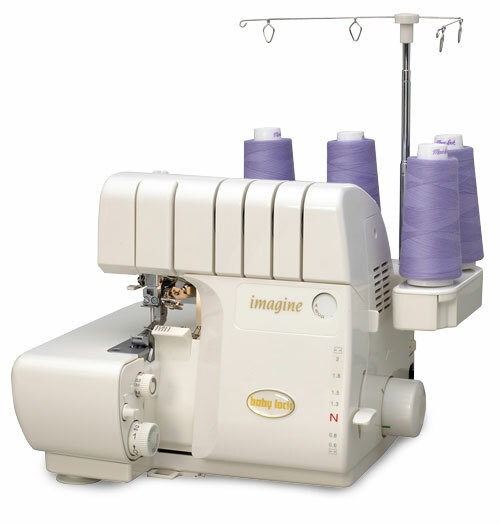 You may be able to alter an item into something more ‘trendy’, mend something that has a hole or re-fashion the entire garment into something new. PS – this book is well worth the read, especially if you are a shopper. Or a clothing horse like me. 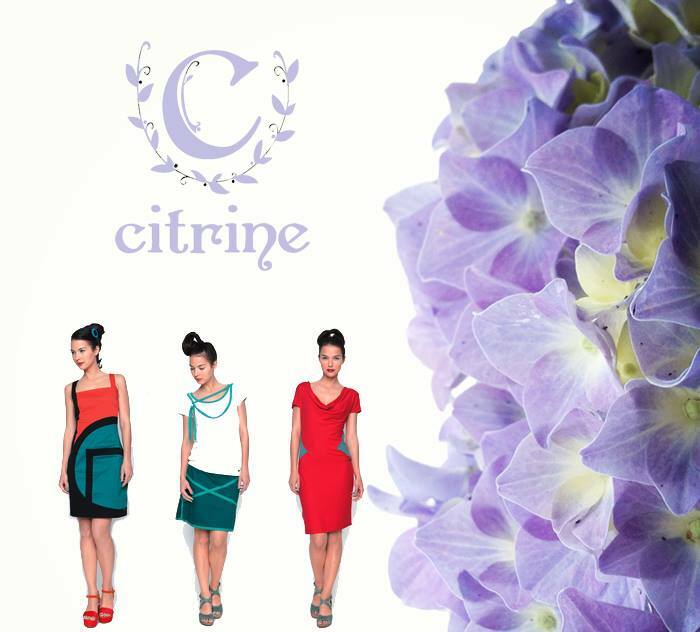 Categories: great Style and NEW! out of the box! Over, in the ‘old’ country, I encountered serious doubts about a particular dress I was eying. Today, with the temperature hitting summer-like highs, I wanted to wear this dress and prove to the world that it can be done with the right attitude. I’m not wearing a skimpy sandal – I am wearing the heaviest boots I own. And so I will ride my horse bike into the sunset…. wild print, short skirt, Frye boots! fake wrap dress, BIG boots! With that, I shall now take a long walk and frolic in the sunshine!